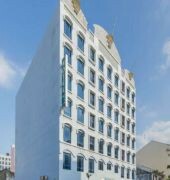 Hotel 81 Palace is a 7-storey hotel dedicated to delivered quality accommodation at decent rates. Hotel offer good clean room with queen size mattress or 2 single mattresses, colour TV with cabled channels, attached toilets(with complimentary essential toiletries), broadband cabled in room. 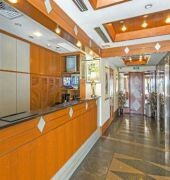 Hotel is rather centrally located, well served by various modes of public transport and within a vibrant neighbourhood. With the following cabled channels : Fox Movies Premium, Football Channel, Discovery Channel, Australia Networks, Super Sport Arena, Euro Sport News and equipped with coin operated washing machine/dryer. The HOTEL 81 PALACE is a Tourist hotel. Located in City Centre - Geylang area. Shopping is accessible by bus/taxi and the nightlife/restaurants are within walking distance from the hotel. 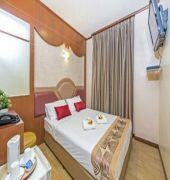 Descriptionclass="small" style="text-align: justify; font-size:11px;">Hotel 81 Palace is a 7-storey hotel dedicated to delivered quality accommodation at decent rates. Hotel offer good clean room with queen size mattress or 2 single mattresses, colour TV with cabled channels, attached toilets(with complimentary essential toiletries), broadband cabled in room. 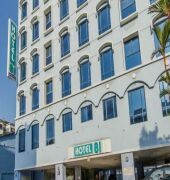 Hotel is rather centrally located, well served by various modes of public transport and within a vibrant neighbourhood. With the following cabled channels : Fox Movies Premium, Football Channel, Discovery Channel, Australia Networks, Super Sport Arena, Euro Sport News and equipped with coin operated washing machine/dryer.